^ "RSC History". Rsc.org. 2014-04-02. Retrieved 2013-01-08. ^ "RSC Contacts". Rsc.org. 2014-04-16. Retrieved 2013-01-08. ^ David Waddington. "Obituary: Sir Richard Norman". The Independent. Retrieved 2017-03-19. ^ "Anglia Ruskin University's Honorary Graduate Site". 2012-12-22. ^ "Professor Charles Rees". The Independent. Retrieved 2017-03-19. ^ Sir John Meurig Thomas. "OBITUARY: Professor Howard Purnell". The Independent. Retrieved 2017-03-19. ^ "Ledwith speech". Lut.ac.uk. Retrieved 2017-03-19. ^ "Simon Campbell CBE". Rsc.org. 2006-12-14. Retrieved 2017-03-19. ^ "Dave Garner - The University of Nottingham". Nottingham.ac.uk. Retrieved 2017-03-19. ^ "Home - Professor David Phillips, CBE, FRS". Imperial.ac.uk. Retrieved 2017-03-19. ^ "Press release: Royal Society of Chemistry welcomes new president". Rsc.org. 2014-07-09. Retrieved 2017-03-19. ^ "Presidential Plans". Rsc.org. 2014-07-09. Retrieved 2016-07-09. ^ "RSC Website – Designatory Letters". Rsc.org. Retrieved 2013-01-08. ^ "Statutory Instrument 1990 No. 2463 The Food Safety (Sampling and Qualifications) Regulations 1990". Opsi.gov.uk. 2012-02-03. Retrieved 2013-01-08. ^ "RSC Web page MChemA". Rsc.org. 2014-06-16. Retrieved 2013-01-08. ^ "Series". Rsc.org. Retrieved 2017-03-19. ^ "RSC Gold". 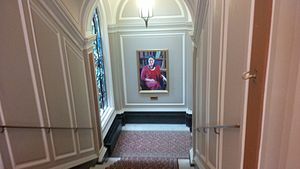 Royal Society of Chemistry. 2016-04-22. Retrieved 18 December 2014. ^ "Chemists' Community Fund - formerly the Benevolent Fund - Royal Society of Chemistry". Rsc.org. 2016-04-27. Retrieved 2017-03-19. ^ a b c d "History of the Benevolent Fund". 2016-04-27. Archived from the original on 2008. ^ "RSC prizes and awards". Rsc.org. 2014-04-02. Retrieved 2013-01-08. ^ "Harrison-Meldola Memorial Prize". Rsc.org. 2012-09-01. Retrieved 2013-01-08. ^ "Corday-Morgan Prizes". Rsc.org. 2012-09-01. Retrieved 2013-01-08. ^ "Marlow Award". Rsc.org. 2012-09-01. Retrieved 2013-01-08. ^ "The interactive lab primer- Learn Chemistry". Chem-ilp.net. Retrieved 2017-03-19. Wikimedia Commons has media related to Royal Society of Chemistry.